It looks like Apple wants to get rid of the notorious red notification number that you find on app icons in iOS; and, the change is going to start with the iTunes App Store. You won't be seeing the notification number on the app icon in iOS 7, because Apple is finally adding automatic updates to the platform. This is a feature that has been long overdue, but given the talking points throughout the keynote, it sounds like the reason Apple held back automatic updates is because of concerns about power usage. Earlier in the event when talking about the full multitasking that is also finally making it to iOS, Apple noted that one piece of the power-saving to make it possible was "opportunistic updates", which would have apps update in the background when the device was already powered-up rather than waking the device to perform updates. 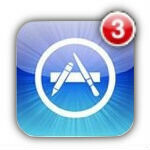 It sounds like that may have been a major issue holding back auto app updates in the App Store. Still, this should make it much more convenient for users, and also make it a lot better for developers, who should now have more and more users on the newest version of the app. Less tech aware users don't tend to update software as much, and this should fix that issue. This is only...a few years late. I really hope this feature can be turned off. I like to find out what changes are made with the updates before I install each one. Agree with you. I never allow auto update on my device cause I like to check out what the update does and if permission have changed. I hope Apple have left his up to their customers if they want auto updates or not. I'm sure it will, you can choose not to update automatically on other platforms. Can't imagine why Apple wouldn't let you here either. If this cannot be disabled I can see a lot of angry users if it eats into their data plans if it does it over cellular when they only wanted it to do it over wifi. Hope there is an option. That would be a nice feature but I personally dont care whether angry birds auto updates or not. Having the ability to turn updates off will benefit me in my job as an IT specialist. Having the ability to turn off updates would be cool. Less people messing crap up. People at home won't know the difference.